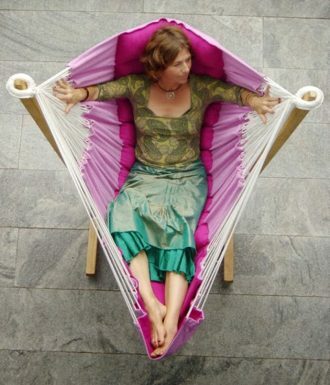 Bohorockers, short for bohemian rocking chairs, is a luxury hanging chair that can fulfill your hammock dream, without compromise. Wonderful. Ecstatic. Blissful. It feels like floating on a cloud. 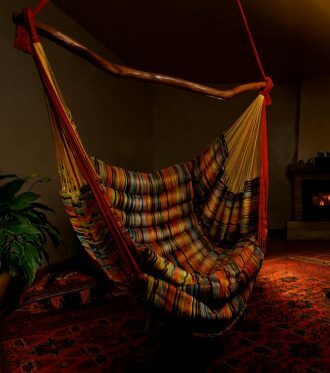 Bohorockers Hammock Swing is a suspended lounger made from luxury fabrics to create a cozy cocoon to find peace and calm in your home. It is both, elegant and comfortable. It hangs like a piece of crafted art in your space. 2 WHERE TO HANG YOUR BOHEMIAN ROCKER? When ordering the Bohorockers Chair, you may choose the color for each side of the hammock bed and also the color of each side of the cushion bed, which gives you a number of different possibilities too. The chair is 12o cm wide, so you feel free and easy and relaxed inside. It is designed also to fully recline to a total length of 210 cm. The chair is both, easy to get out and easy to get in. 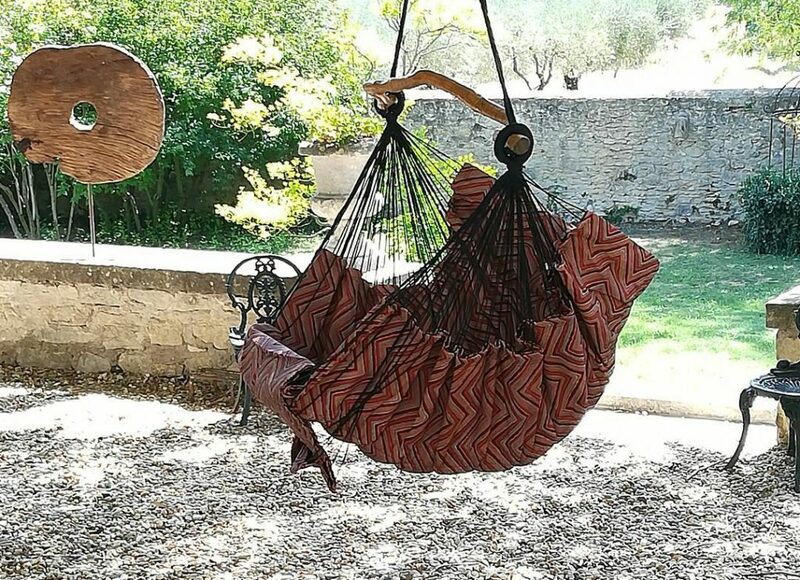 The unique shape of the swing seat is achieved by using different lengths of the rope getting the hammock form that gently nests you. Twelve sausage cushions add a deeper comfort to your sitting experience and weigh you in total comfort, while an integrated leg extension lets you stretch out. 12 poly fibre densely stuffed integrated sausage cushions. 120 cm diameter carved wood pole, string triangle to a stainless steel 318 swivel carabena. 90 meters of weather-resistant polyester rope. Integrated leg extension to sit or recline up to 175 kg. Your chair will look unfaded and unfazed after years. The fabrics for the chairs are luxury, soft washable and stain treated. They are tactile and soft to the touch. The inside chair is made of fake furs and fake suede. The outside chairs of sunbrella of acrylic fabrics. They are weather resistant and can stand the test of time. WHERE TO HANG YOUR BOHEMIAN ROCKER? Bohorockers hanging chair is the best when hangs from an expanding eye bolt drilled into a concrete ceiling or into a wooden ceiling joist beam. Hanging the Bohorockers “pivot style” from a single point allows you a 360° swing experience where you can rotate and swing free. Bohorockers “Swing” 2018 self-supporting stand allows you to hang your swing hammock on the deck and by the pool, where hanging from above is not possible. Made from zinc and powder coated mild steel and an oiled wood footplate. It has a load bearing strength, maximum weight of 175kgs is easy to erect, stable when swinging and robust in all weather. This beautiful design is so timeless and distinctive that it has been copied over and over again. 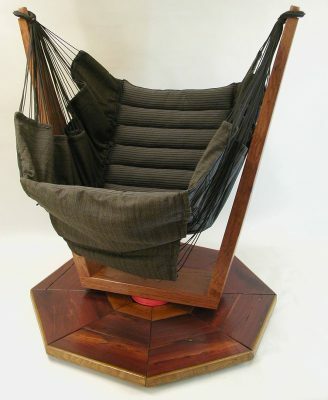 We can understand that this design is worthy of imitation, however, we would like to bring to your attention that many of those hammock chairs like this you can find recently out there, like the CilloutChair from Latvia are a copy of Bohorockers Siesta Chair designed by Philip Cooper in 2002, which is the original designer. 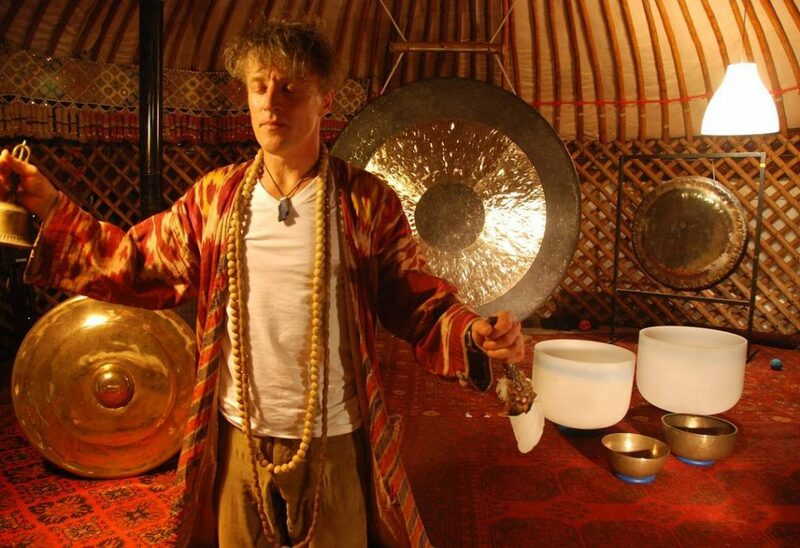 Having traveled through my 20’s around the world, funded by ski seasons working as a healing artist combining massage, gongs and hypnotherapy I landed in Tarifa, Spain as kite surfing was just beginning. 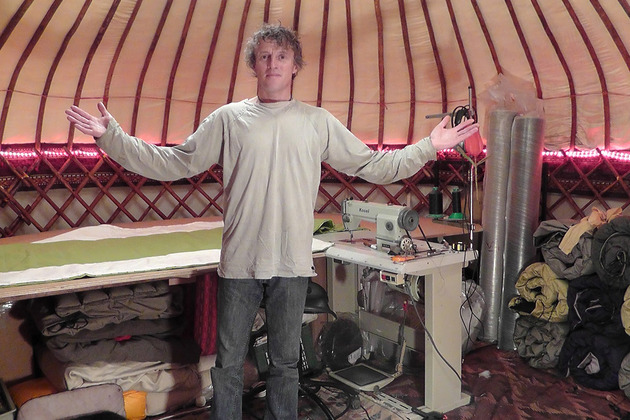 I had been living buried in an Uzbek yurt tent in Val d’Isere at 1800 meters in the winter seasons, which had given me a foundation in green wood work and using a sewing machine. So when I came to Tarifa and fell in love, getting married, I thought to create a more permanent business. In 1994 I traveled to Chile to experience a total solar eclipse, and after continued onto Brazil. While there I bought some traditional chair hammocks as one sees online. On my return, however, I realized they were dysfunctional and although we dream about them, generally they ended up under someone’s bed, unused! 6 years after buying them, and sitting uncomfortably …I had a vision of how to make them better. I bought a sewing machine and some fabric and tried to realize my dream. I sold the first ones to the mistral surf centre. Soon though I realized I wanted to have my feet up, so I created the integrated leg extension. In 2004 the chairs got featured in Habitania, a 4-page color story in a home decoration magazine and El Pais newspaper in Spain. design…identically…calling it Chill Out Chair. At the same time, a man from Seville did the same thing and called his company Evercasa. I asked them both to firstly stop, secondly to give me credit for my efforts. 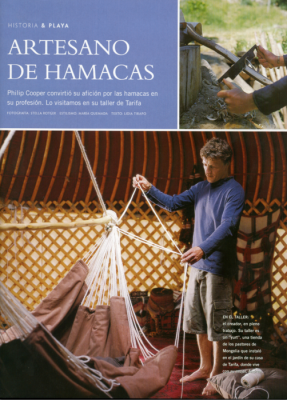 I was surprised they both copied me identically, using webbing to connect the strings to the fabric at the same distance and number, the same length….everything identical. Normally one takes a design and includes and transcends it by making 8 changes…but these people were not people who were designers or hammock sitters…more opportunists. By 2006 though I changed the string lengths to make the chair more supportive, and had enough of taking the hanging chair cushions from the peoples’ sofa and returning them to the chair, so I decided to sew in 12 sausage shaped cushions. My lazy minded copiers couldn’t be bothered to do this as it adds nearly double the labor time…but from my perspective…takes the chair to another comfort style dimension….and already they were the most comfortable on the market. I have been exclusively a manufacturer. I did ask them to buy the chairs off me, but you can imagine what was said when it ruined their false stories. My designs were sold to companies such as Maranon hammocks, David Jones in Australia, Shooky in France, companies in the UK and South Africa, even Mexico. Bohorockers have not had a social media or google image presence and it is only now I begin to sell retail, online, creating small batch collections. I thank Chill Out Chairs and Evercasa for celebrating my design, and wish them all the best, with the hope one day they give me the credit for creating a living and lifestyle for them. As I say, may all who sit in my chair, be happy! It is a romantic ideal to indulge luxuriating into a functional beautiful swing chair. We dream of a bit of bohemian style but are so often disappointed about the experience. You will not be disappointed by your Bohorockrs chair. On the contrary, you will no doubt celebrating your new bohemian hammock chair with your friends and family as one of your best buys ever. Let’s get a Bohorocker into your life.